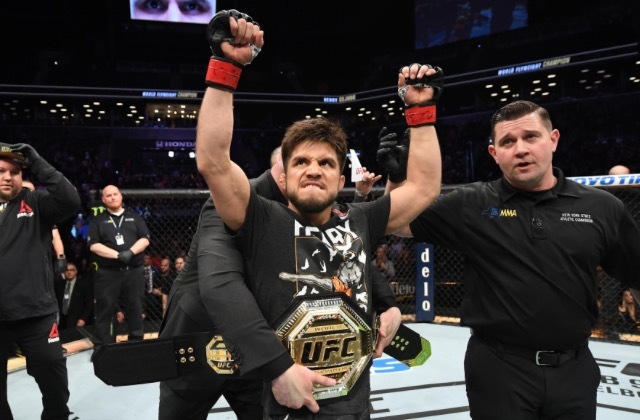 On Saturday night, January 20th, 2019, the UFC flew its banner across the illustrious walls of Brooklyn’s Barclays Center. Moreover, for the first time in its history, the MMA powerhouse showcased its electrifying content on the biggest multinational athletics platform known to man; the ESPN. Not only was this feat a giant step for the UFC, but it was a tremendous step for the sport of Mixed Martial Arts as a whole. 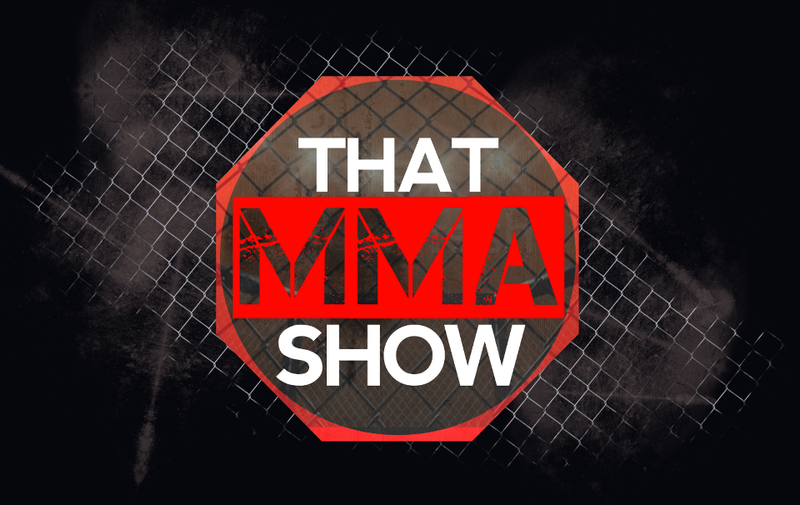 It wasn’t so long ago that the sport of MMA was considered worthy of no more than a cult following. As of Saturday evening, MMA joined the ranks of American Football, Baseball, Basketball and more on the most recognizable sports network in the world. 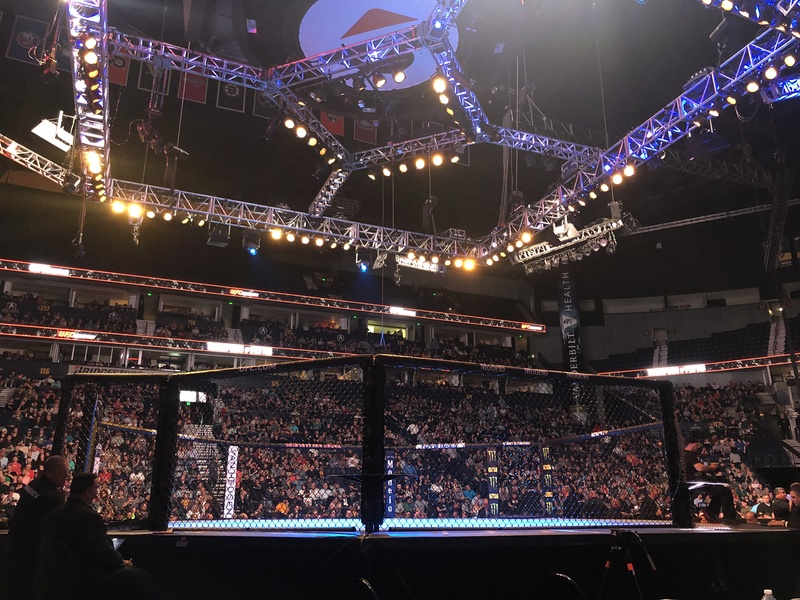 Given its new level of exposure and ever-hastening momentum, one can only assume that MMA will soon rival these great American pastimes in popularity. In order to properly inaugurate this historic union, the UFC assembled a card that was certain to capture the attention of the masses. 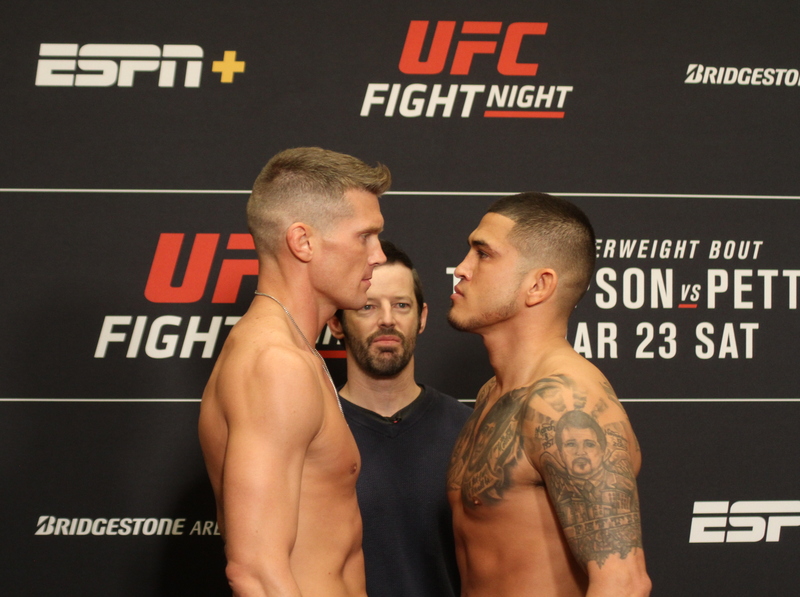 At the top of the event was a flyweight super-fight between brand-new flyweight champion, Henry Cejudo, and the current/2-time bantamweight champion, TJ Dillashaw. 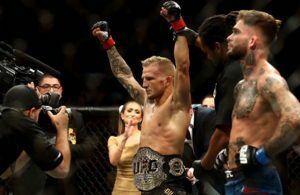 Going in to the fight, many expected Dillashaw to come out on top due to his tremendous skill, and wins over world class champions such as Cody Garbrandt and Renan Barao. On the other hand, Henry Cejudo had a little more skin in the game, seeing as it had been rumored that this title defense could determine whether or not the UFC scraps the flyweight division. Moreover, Cejudo had just come off of a win over Demetrious Johnson, who was known as the best pound-for-pound fighter in the world at the time. Therefore, the contest was brimming with hype and anticipation. When the referee finally unleashed the champions upon one another, the fight seemed to happen in a flash. While Dillashaw came out, simply moving around and trying to settle into his groove, Cejudo came out “throwing heat” immediately. Cejudo landed a hard body kick and right hand immediately. Dillashaw came back with two calf kicks to the lead leg. After rolling a lead hook and shoving Dillashaw to the mat, Cejudo threw a head kick that was blocked by Dillashaw upon his rebound to the standing position. Although the kick was blocked, it still seemed to have an effect, for Dillashaw was staggered by the blow. Soon after, Cejudo dropped Dillashaw with a “Laser” right hand, and swarmed upon him with hard, short shots from the back. Dillashaw managed to follow a single-leg and stand up amidst the barrage of punches, but he was immediately floored again by a vicious flurry of punches from Cejudo. Shortly thereafter, the referee dove in, and waved off the bout. In the co-main event of the night, the former NFL Pro-Bowler, Greg Hardy, made his promotional debut against Aaron Crowder. Formerly known as one of the best defensive ends in the NFL, Hardy has since gone on to stack up an impressive record as mixed martial artist. As an amateur, Hardy racked up three first round knockouts, and three more as a professional on Dana White’s Tuesday Night Contender Series; all in less than a minute. His opponent, Allen Crowder was the more experienced of the two, coming into the fight with twelve professional fights, including one in the UFC. Nevertheless, the majority of the fans were expecting Hardy to dispatch of the much lesser known, Crowder, in a manner reminiscent of his past performances. When the fight commenced, Hardy came out the gate throwing bombs as per usual, tagging Crowder on several occasions. However, Crowder was able to weather the early onslaught, and land a takedown about two minutes into the first round. From that point on, he controlled Hardy for a good two minutes, keeping Hardy on his back. However, Hardy was able to regain his feet in the last minute and land some “ground and pound” after Crowder attempted a flying guillotine. Seemingly ill-prepared for his first second round, Hardy looked quite fatigued. Nevertheless, he still came out trying to put big shots together. Crowder ate a few shots at first, but Hardy’s fatigue gave him a chance to turn the tide eventually as he walked Hardy down, talking trash and throwing a flurry of hard combinations. At the end of this staggering combo, Crowder shot for a takedown. Hardy stuffed the takedown, and shortly after, made the very poor decision of kneeing Crowder to the face while he had both knees on the mat. Referee, Dan Miragliotta, immediately jumped in and stopped the fight due to the blatantly illegal blow. Shortly thereafter, UFC doctors examined the seemingly dazed Crowder, and waved off the fight. Allen Crowder was deemed the victor by disqualification. Certainly, this result was not desirable for either fighter; especially for Hardy who was coming into this fight with a bad reputation as a domestic abuser. Many see his blatant foul as a testament to Hardy’s lack of moral character. Others see it as a terrible error made by an inexperienced fighter. Nevertheless, Hardy looked good before the foul, and should receive another chance according to Dana White. Yet another highlight bout of the card was the matchup between Donald “Cowboy” Cerrone and Alex Hernandez. This bout was Cerrone’s first fight back down at lightweight after spending an extended amount of time fighting top contenders at Welterweight. Moreover, Cerrone expressed his intent to “Chase the gold” in this next lightweight stint, instead of taking fights merely for the thrill. Hernandez was coming into this fight with only two fights in the UFC the year prior. However, both fights brought him impressive victories over top fighters, Beneil Dariush and Olivier Aubin-Mercier. Therefore, Hernandez was looking very much like a rising prospect in the lightweight division. Hernandez made it clear that he thought very highly of himself as well, as he dragged Cowboy’s name through the proverbial mud going into the bout. During the pre-fight press conference, Hernandez referred to Cowboy as an “Old”, “Withered”, “Stepping Stone”, angering Cerrone and inspiring him to make the young fighter “respect his elders”. When the fight commenced, Cerrone started slowly, as he usually does. Hernandez took advantage of the slow pace, coming out the gate strong and landing several big shots on Cowboy. Nevertheless, Cowboy rallied back, tagging Hernandez with several big right hands and 1-2 flurries. Going into the second round, Cowboy was mixing up his attack beautifully, landing big elbows/punches up top and powerful knees/kicks to the body. Cerrone finally dropped Hernandez with a perfectly timed head kick. Shortly thereafter, Cowboy followed Hernandez to the ground, landed a few shots from full guard, passed to side mount, and pounded Hernandez out until the referee stepped in. It was a tremendous performance for the aging fan favorite, and it proved that a focused, “Pissed off” Cowboy is a scary one. UFC Fight Night 143 was a card of explosive proportions. A combined ESPN+ subscription of over 500,000 people would suggest that the UFC/ESPN union was a great success as well. One can only assume that this partnership will only continue to benefit both tremendously as time goes on.